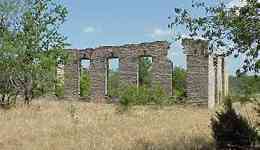 Kimball, Texas, ghost town in Kimball Bend Park. Editor's Note - Our thanks to Jeff Boutwell, Recreation Specialist, Mid-Brazos Project/ Waco Lake, for his photos and information on Kimball. We have included his letter as text for this town page. I would like to make an addition to your Ghost town list. It is the old town of Kimball, Texas located in Bosque County about 20 miles south of Cleburne and 15 miles north of Meridian on State Highway 174. It is located on the Brazos River and is the location of one of the major crossings of the river by the Chisholm Trail. The town was established in 1853 by Judge John Kimball from New York. He bought the property from Jacob DeCordova. The town was plated by McLennan and Erath. It was a thriving town and a center of commerce during the cattle drive years. It had a gin, numerous stores, several churches, two schools and more saloons than could be counted. The town's cemetery had over 600 burials. It slowly died after the Santa Fe Railroad chose to miss the town by three miles for a narrower crossing of the river. The town existed until about 1910 and had several residences left when the federal government bought out the remaining people in 1947 for the construction of Lake Whitney by the U.S. Army Corps of Engineers. The town is now located within Kimball Bend Park. Several old concrete foundations dating back to the 1870s remain along with the Academy. This was the school building and town meeting center. It is constructed out of cut limestone with arched windows fitted with keystones. There are even old town streets still discernable . The park is immediately off State Highway 174 where it crosses the Brazos River. "You can stand at the exact spot that this photo was taken and you will be looking down Lubbock street ( which is now a park road) and see the three large oaks and the first building to the right which is still standing." What's left of "the first building to the right"